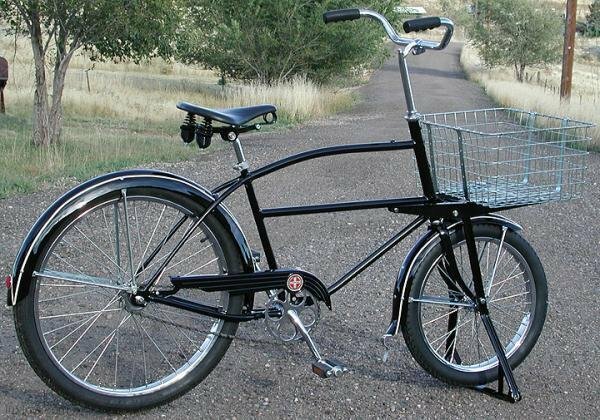 The Cycle Truck was Schwinn’s Heavy Duty Delivery Bicycle (The Work Horse of the Industry) and was Widely Used throughout the 1950′s. It’s a Beautiful Bicycle that’s Tough, Quite Unique and Highly Sought After by Collectors. The Cycle Truck has a Unique Drop Stand that’s Quick to Service and Supported the Bicycle and Payload. Cycle Trucks came with 2 Different size Baskets and a Sign Display for the Company’s Name. 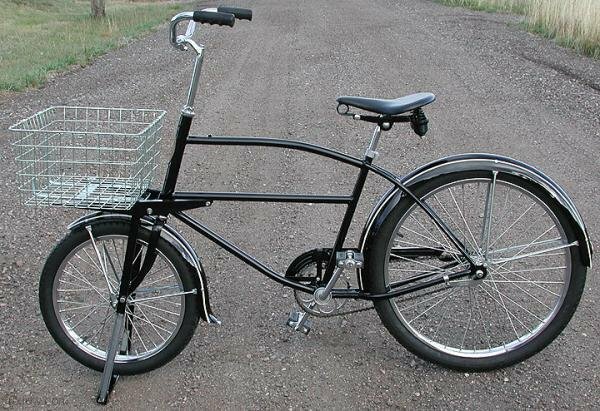 This 1952 Cycle Truck has a Re-chromed Original CT Crank, Skiptooth 4 hole Sprocket, AS CT Stem, Morrow Hub, S-2 Tubular Rims and Original Basket and Stand Hardware. The Bicycle has an Original Head Set, Bottom Bracket, and AS Seat post Clamp. 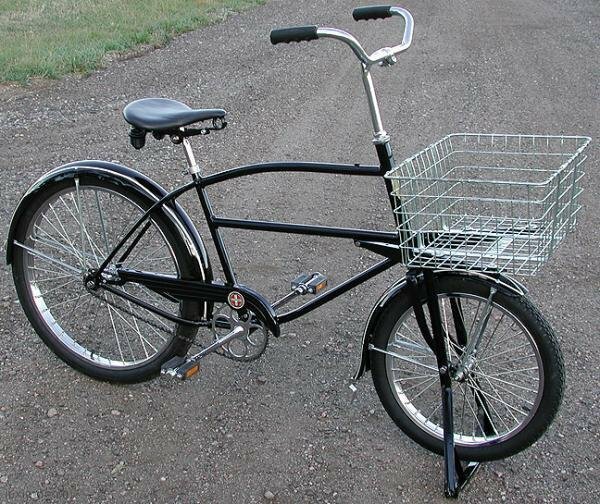 It has New Handle bars with Original Schwinn Script oval Grips, and Arnold Schwinn AS Pedals. 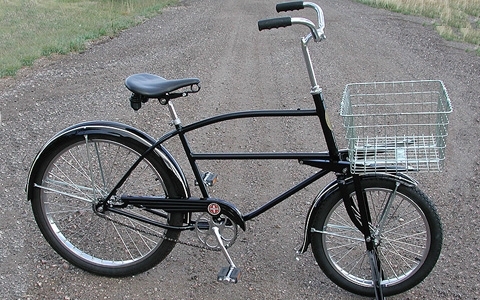 The Seat is an Original Schwinn / Messenger Beautifully Restored in Leather. The Chain is a Really Nice, Close to NOS, Diamond Roller Skiptooth Chain. 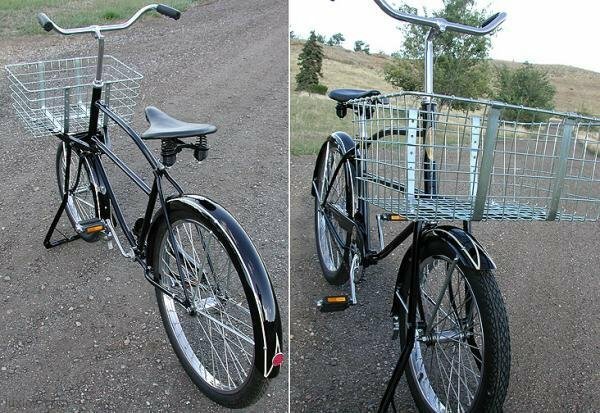 The Front wheel is an Original Rebuilt Bendix Cycle Truck Front Hub Laced with Huge Heavy Duty Stainless Steel spokes to a Original Re-Chromed S-2 Rim. The rear Wheel is a Beautiful Re-Chromed and Rebuilt Morrow Cycle Truck hub Laced with Huge Heavy Duty Stainless Steel Spokes to a Re-Chromed Original S-2 Rim. The Tires are New GoodYear pattern 2.125 Ballooner Black Wall Tires. Click here for Details of the Lux Low Full Antique Restoration Process on this Bike.